It was pretty quiet here in Chicago last night, prices were within a few pennies of unchanged across the CBOT. Up in Minneapolis though, we saw prices for Spring wheat continue to push toward 7.00 with December futures now trading at 6.90, a new high for the move that has been going on for a full 40 days now. 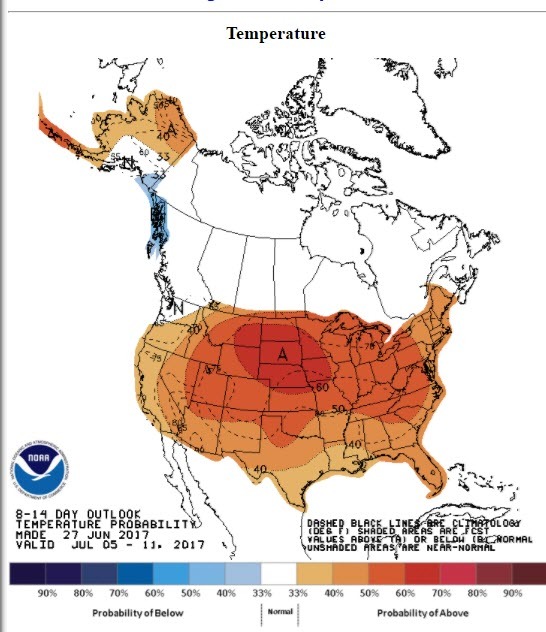 The weather is pretty solid across the soybean and corn belt of late but heat is on its way, and with it I expect prices for corn and beans to make a push back into the upper end of the ranges they traded in the early part of June. Look at buying August or September short dated options (derivative of December futures) on breaks today. I am targeting the Aug 390 call for 6-0 cents, but others might prefer something longer dated. For soybeans I like the September 10.00 call. Models are in agreement about this heatwave approaching, where it is centered is still up in the air. Right now it appears to be more westward, which could bring rain into the eastern corn belt but to be honest that corn stinks right now. It probably needs it but top end yield is gone anyway according to guys I work with east of the Illinois-Indiana border. I am more concerned about what happens to NW Iowa/SE Minn/SW SD if the ridge is west. Regardless, I think the markets are set up for uncertainty which should be good for price in my opinion. 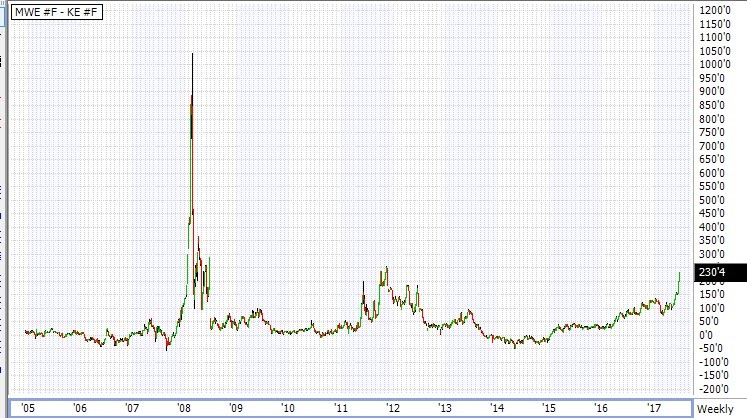 It is hard to predict what happens with the Spring wheat prices, but I have to imagine we do not see an end of this rally on hot and dry. I think KC wheat will follow eventually, but I imagine we are seeing a lot of delivery pressure right now. That has widened spreads between Minny and KC wheat to levels not seen since 2011. July spreads sit at 230, the high that year was 250. If you are long that spread, a potential profit point lies there. Lastly, cotton. The market of late 2016, early 2017 where cotton was up and the CBOT was lower has flipped on its head, the CBOT now holds leadership. I remain short December hedges, but will look to lift on the close of the price gap just below 66.00. I look for bearish news from the acreage report on Friday but I would buy that fact. July is performing into delivery, that keeps me hopeful for another run toward 70.00 before we harvest. Texas weather is now a slight concern, the heat will not help that even against the recent rains.